Discussion in 'Latest Updates and News' started by Landmine, Mar 29, 2019. Cool. I might just use this at version 0.6, 0.7. Mainly because I am afraid of bugs, and I also like GUI support for fast prototyping. Dark UI theme is the only thing I need. So how is this better than original WE I would love for someone to explain. It's pretty good for terraining. It can handle rendering the entire map on your screen without slowing down to an unbearable crawl (like normal WE). It has more brush sizes. 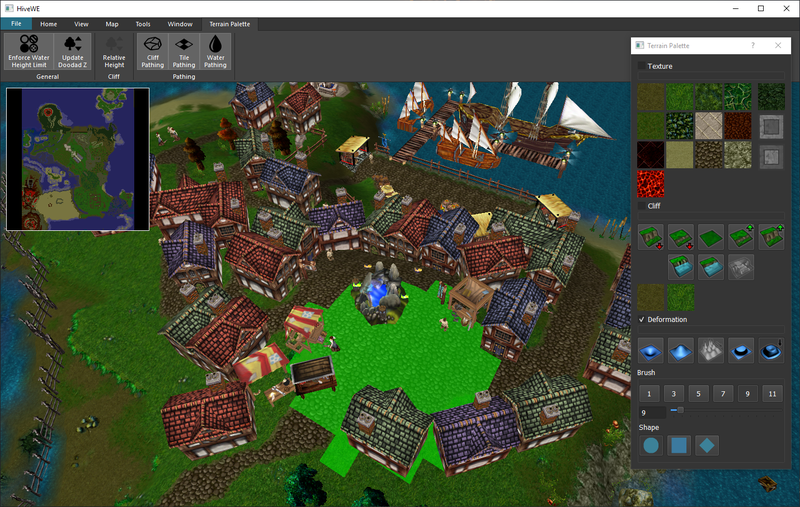 It can edit the pathing map directly. It has some other cool features that WE lacks. The smoothness is really impressive. My map with 40k+ doodads loaded and ran completely lag free in this editor, BUT it lacks too many functions for me to replace the old one. 1: I can't hold ctrl and move the map around as I please. I am locked to one angle unless I click the "switch" button which messes up the camera entirely. 2: There is no unit palette. 3: There is no object manager. 4: Preferences just contains a "?". 5: Theme changes doesn't take effect until restarting the WE. 6: "Home" only contains redo and undo, and there is no "history" shown. It has extreme potential, so I will be keeping my eyes open for updates. Doesn't work "New map" button. Only I have such a problem? How to change the orientation of doodads?